Senator Sanchez, who also happens to be the chairman of the Senate Defense and Security Commission of the Dominican Republic, says the international community must reject Haiti's initiative to build an army. Doesn't the Dominican Republic have an army with thousands of soldiers? you must go and see on February 27 on the "malicon" in santo domingo, how many soldiers does the Dominican army have? it remind me of the old Haiti. the officers are only mulatoes and the soldiers no one else than the blacks. If there's one thing I know from personal experience is that Haitians (not all) say that Dominican Republic belongs to Haiti I heard it several times in my life. But I never heard a Dominican say Haiti belongs to Dominican Republic (not once). Dominican Republic has an army that has never invaded defenseless Haiti. That is exactly what coward so they always want to be aggressor, but the little brother try to stand back on his feet to protect himself from assailant like an abusive neighbour, their gets stuttled, and we far to reach their lever of military force when their Congress has planed to buy 6 more super Canon fighter plans to enforce their air force with a total of 8 of those planes with 4000 personal 33 coast guard boat armed with 50 caliber machine guns and 400 millimeter cabins mounted on almost each, plus a total over 86000 soldiers helicopter, of course we are a threat to them because of the assassination of our innocent poor Haitians living in their territory serking for a peace livibg, they are rejected after being abusively used and underpaid by those Dominican engenders in the building of highway bridges, routes and houses for almost nothing, of course they should feel threatened because the feeble said it is time to stop them for their aggression on our brothers and sisters where their military executed in a truck 8 Haitians for no particular crime commuted in the year 2000 and their press criticized it as barbary, and nothing happened as retribution under Rene Preval, of course they should have fear when they remember that in the past we did not play when Dr François Duvalier attacked their country in defense of Haiti when the battalion of caserne Dessalinnes distorted the church if Dan cristobal with cannon ball shooting. Come on! they all have their own Army, Domincian Republic, USA and so on. Why is it that Haiti can't have an Army. So they could keep Haitian down and keep on building them self stronger. Haiti stand up for your self and build back up your country. Adriano baby needs to mind his own business. 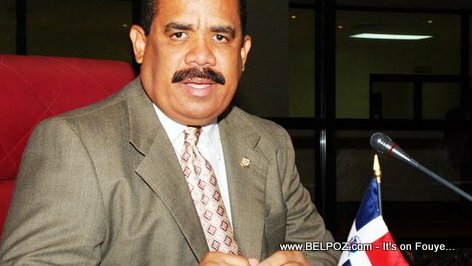 Senatè Dominicain Adriano Sanchez di: Nouvo Lame Haiti ap eseye konstwi a, li reprezante yon menas pou la Republique Dominicaine.